When considering the “new” seven wonders of the world (created by the New Seven Wonders Foundation) as a popularity poll, I find it astonishing that the only single remaining of the original Hellenic seven wonders of the world, the Great Pyramid of Giza (honorable mention) didn’t make the cut, while an Art Deco concrete statue in Brazil did. I have visited three of the seven “winners” including the Great Wall of China, Machu Picchu, and most recently, this month the ancient Nabataean Arab capital of Petra in Jordan. Seven wonders (whether new or old) only begins to scratch the surface of what to see on Planet Earth. The first list of seven wonders of the world was created by Greek scholars—Herodotus (484–425 B.C.E.) and Callimachus of Cyrene (305–240 B.C.E.). Their “seven wonders” was inspired by the number seven in Greek traditional symbolizing plenty and perfection and the known celestial bodies of the time. The Giza pyramids are all that remain. The home of Callimachus, the Greek city state of Cyrene capital of Cyreniaca in present-day northeast Libya, is famous in an historical herbal context as the home of a plant known as Silphion (Greek) or Silphium (Latin) which I would categorize among the seven botanical wonders of the ancient world. It survives as an image on Cyrenian coins. The root was worth its weight in silver. Famed as an herbal contraceptive of the ancient world, it was harvested to extinction. If you really want to pad your bucket list, the best one stop shopping is UNESCO’s World Heritage Sites list which includes 981 properties/locations of cultural and natural heritage of value to all of humanity. The list includes 759 cultural, 193 wonders of nature sites, and 29 mixed (cultural and natural) locations. That means to cross off that entire bucket list, I need several winning grand prize lottery tickets. I’ve only been to 39 World Heritage sites (less than 4 percent). Like Machu Picchu (landscape aspect images) which I’ve visited four times, Petra cannot be seen in a single day. Situated between the Red Sea and the Dead Sea (which surprisingly is not included on the World Heritage list), Petra has been inhabited since prehistoric times by Arabs, Greeks, and Romans, among others. Although two millennia old, the Roman ruins at Petra look decidedly new compared with earlier ruin at this extraordinary seat of human history inhabited for at least 10,000 years. It has been a stopping point for nomadic Bedouins since it was abandoned by Crusaders who built a fort there in the 12th century. The famous, Khanzeh el Faroun (Treasury of the Pharoah) a façade more than 150 feet tall, carved out of the rose-red sandstone contains no Nabataean architectural elements, but reflects Alexandrian and Hellenistic design traditions. 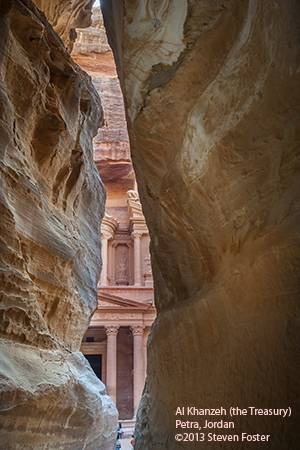 A place of extraordinary human and natural beauty, put Petra on your bucket list. I will be happy to be your guide.